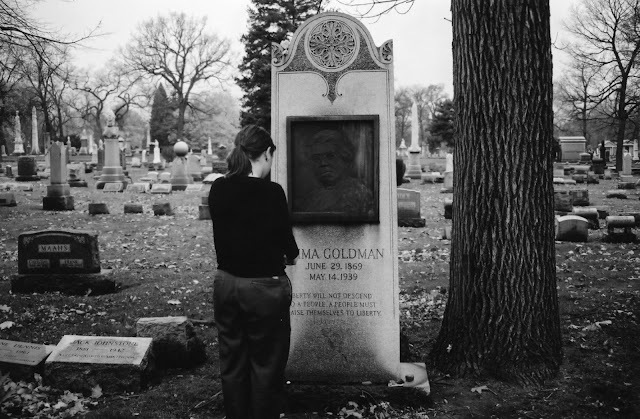 With the 143rd anniversary of the birth of Emma Goldman earlier this week, I'd like to revisit my photographs from Chicago's Forest Home Cemetery (also known as Waldheim Cemetery), where Goldman and many of her peers are interned. In November 2000 I took a train trip across the country, from San Diego to Philadelphia and back, with some stops in between. I had a 7 hour layover in Chicago and decided to take a very icy, very cold trip by foot and subway to Forest Park. 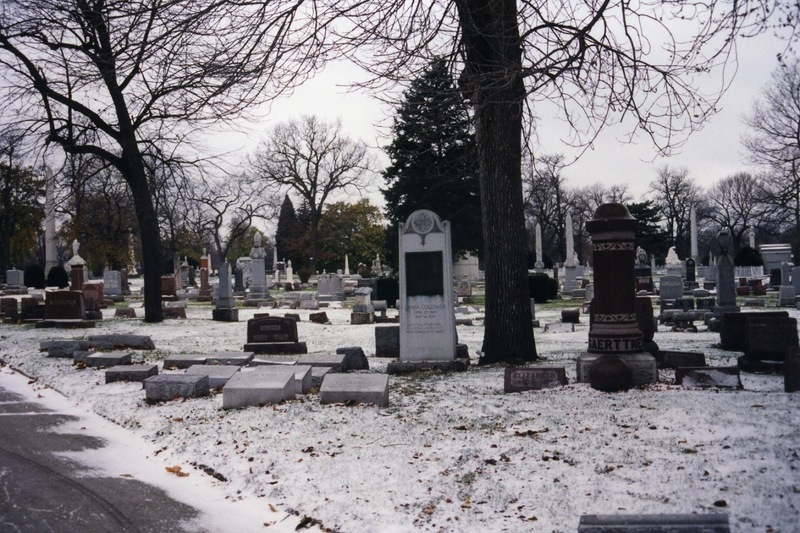 It was snowing hard when I walked into the cemetery's office. 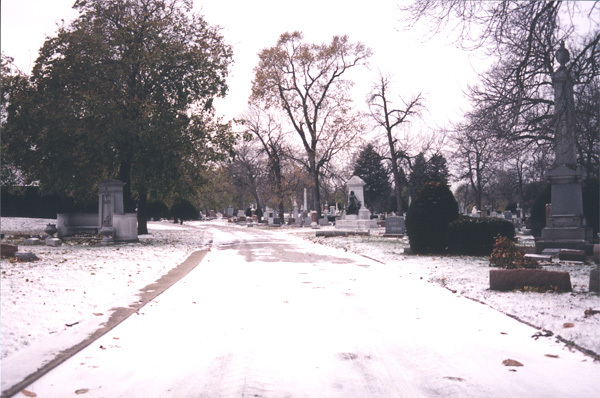 I had walked the 1/2 mile or so from the subway in the snow and single digit temperatures. I remember the look on the man behind the desk's face to this day. I'm sure he was thinking how terribly underdressed for the weather I was. 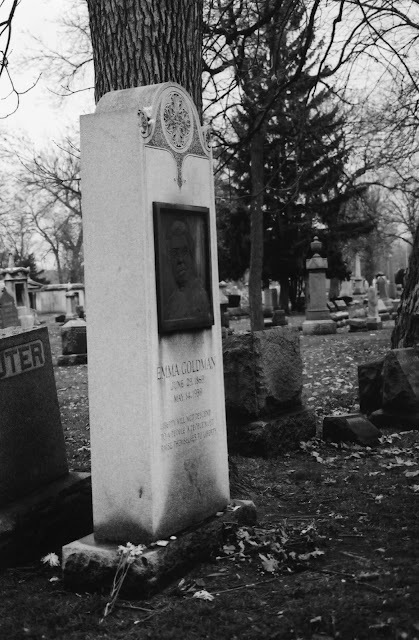 When I asked him if Emma Goldman was buried there, he nodded, and then pointed up the main road. Um.... thanks? Up the slippery road I went. I had no idea what I was looking for. What I did know, from my knowledge of Goldman and her life, was that she chose to be buried at Waldheim near the Haymarket Martyrs, the men who remained a constant inspiration to her throughout her life. If I found them, I knew I'd be on the right path. The Haymarket monument is absolutely breathtaking. As I approached it that day I was overcome with the feeling that I was experiencing something that was going to change my life. It's one thing to read a book, or see a photograph, but it's something else completely to stand on the same ground where something special happened. I didn't stop to pay my respects, though. 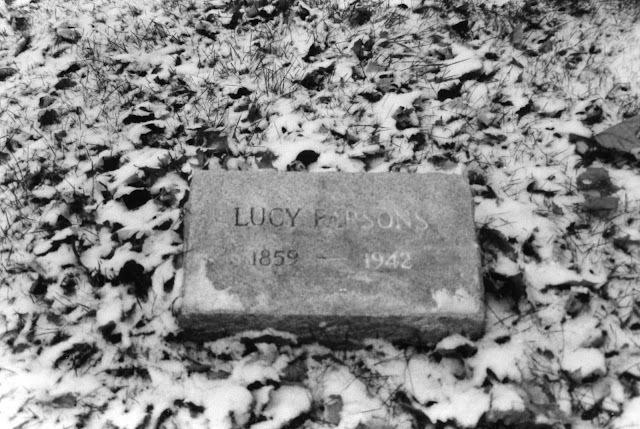 I didn't even stop to take this photograph (which was actually one of the last I took during this visit to the cemetery). 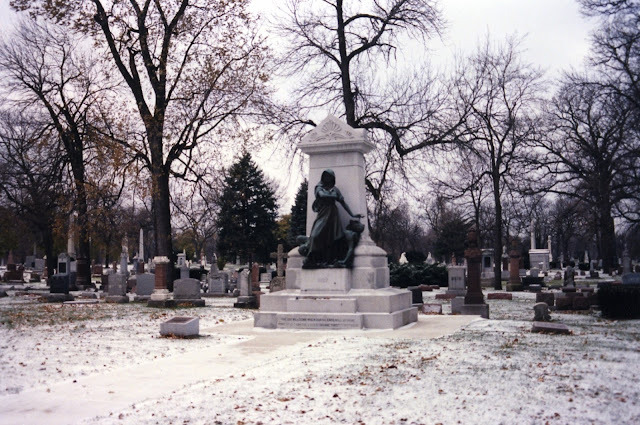 I knew right away that if I was at the Haymarket martyrs graves, that I had to be close to my beloved Emma. 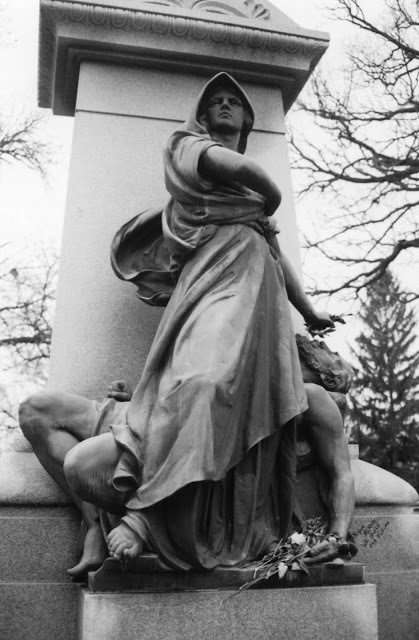 I guiltily shuffled past the monument, knowing that I couldn't stop until I found her. 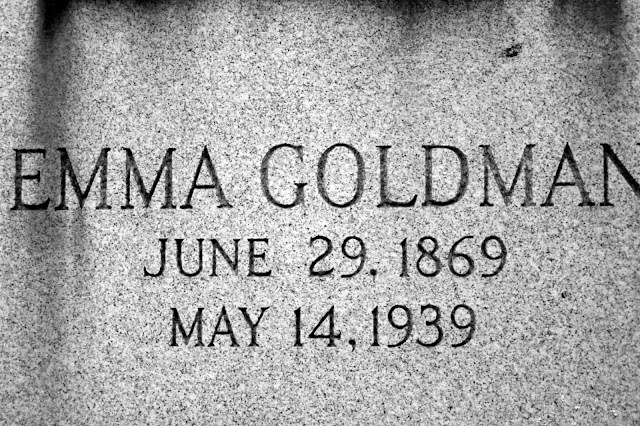 Luckily for my numb toes and gloveless fingers I found Goldman's grave shortly after passing the Haymarket monument. There were flowers and stones and trinkets and letters on the ground around her grave. Looking back on the photographs, the graves I wanted to see were not that far from the entrance of the cemetery. I spent quite a while there, leaving my own trinkets and a note written on a receipt from my travels before revisiting the Haymarket martyrs. 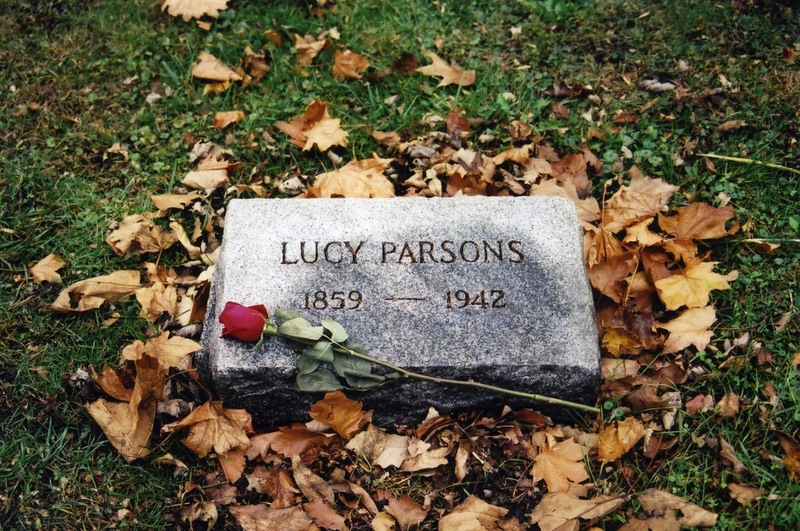 Other graves of note in the Goldman/Haymarket vacinity are those of Lucy Parsons, author and wife of Haymarket martyr Albert Parsons; anarchist and feminist Voltairine de Cleyre; and women's rights educator and activist Elizabeth Gurley Flynn. In November of 2004 I flew to Chicago to meet friends for one of three nights of Pixies concerts at the Aragon Ballroom. The day after the show we made our way to Forest Home. It wasn't the snowy and frigid cemetery I'd visited 4 years earlier. 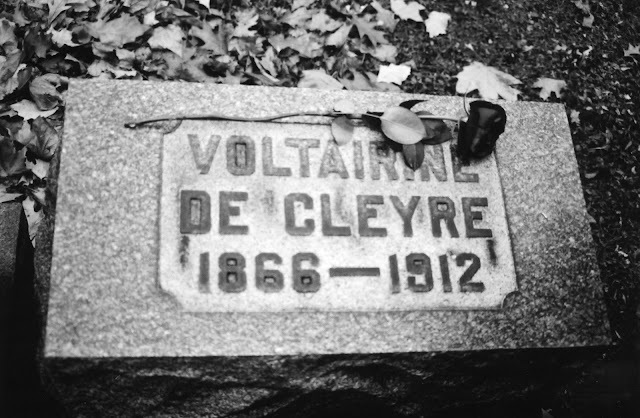 The weather was damp and pleasant and as my friends wandered I revisited the graves I had four years prior. It was November 17th, the birthday of Voltairine de Cleyre. 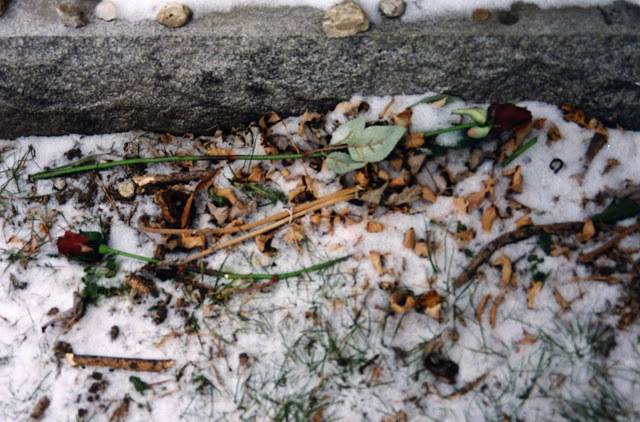 I took a flower from Emma Goldman's grave to place on her friend's for her birthday. 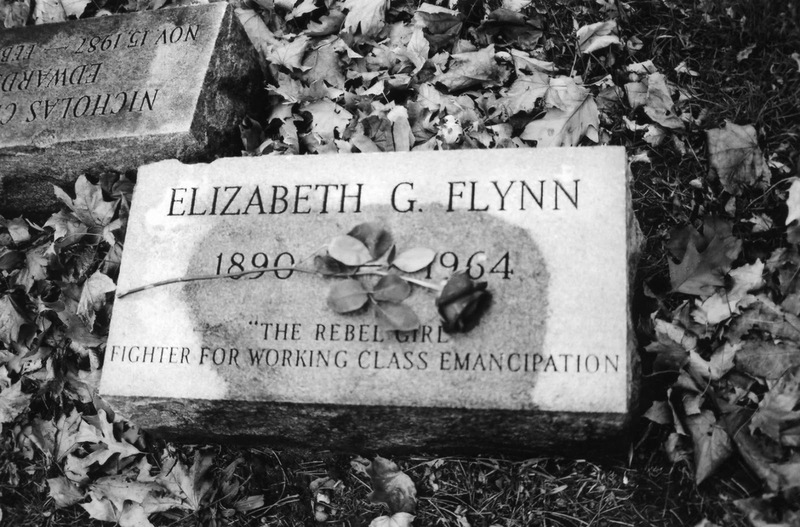 I know she would have approved. I implore anyone not familiar with Goldman, the Haymarket martyrs, or the others whom I've I've mentioned in this entry to please look them up. AK Press Publishing and Distribution is a tremendous resource that I highly recommend.